Our hoomin mum recently traveled to the country Peru. She told us dat she met some very nice kittehs. We luv to hear about cats around da world. First she met some cats at Kennedy Park in an area of Lima called Miraflores. 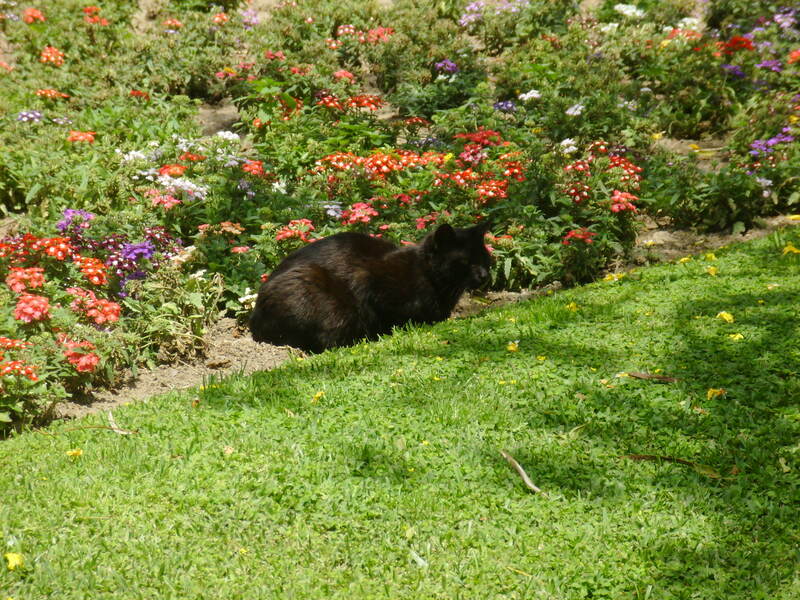 These cats were romping around da park, hiding among da flowers, people watching. Mum said the Lima cats were friendly and let her take their picture. Rumichaka cat wif mum's friend, Julianna. Mum also met a lil’ kitteh in Rumichaka, Peru that is almost 90 minutes from Cuzco, Peru. Da Rumichaka cat was very young and lives an adventurous life in the Sacred Valley of Peru. Mum’s travel friends gave the kitteh some milk and cuddled her and gave her nice rubs. We hopes da Peruvian cats are doin’ okay. And, we happy mum back home so she can snuggle and cuddle wif us! Check out some more pictures of Peruvian kittehs. This entry was posted on Monday, November 28th, 2011 at 1:39 am and is filed under Feline Lifestyle. You can follow any responses to this entry through the RSS 2.0 feed. You can leave a response, or trackback from your own site.